Leadership Training and Leadership Development Programs by Peak Performance! Free Five Minute Leadership Workshop. Whether you are a leader in your company or you aspire to be, you can take this five minute workshop right there at your desk to you improve our leadership skills. Click here to go to the Five Minute Leadership Workshop page. �Most leaders get decision-making ALL WRONG!" Decision-making is not an event, it�s a process you can learn to improve. The Peak Performance!� �Getting Decisions Right�� course teaches leadership skills that will help your company excel, even in difficult times. Use six other key components of optimum decision-making to strengthen your team�s effectiveness. Differentiate and use Cognitive Conflict and Affective Conflict for optimum results. Can you afford to get decision-making �all wrong"? Not these days! that will equip your leadership to move your company in the right direction. Peak Performance!� is a performance-enhancement training company. We help people improve the way they think about themselves and work with each other. We get people �singing off the same page�, focused on the same goal, and excited to be working together. Unique, customize leadership training activities -- indoors and outdoors, all year round. Corporate leadership training -- at your place of business or at remote locations. 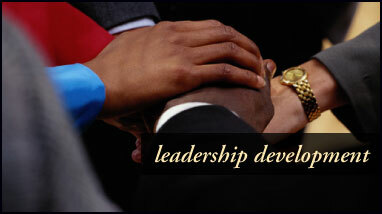 Leadership communication skills training -- to enhance your leaders' effectiveness. They want an incredible special event like a retreat or outing. They want us to work with them over some period of time to improve group effectiveness. They want us to handle their ongoing staff training. If we don't deliver exactly what we promise, your company pays nothing. That's how confident we are that your employees' leadership skill will improve dramatically after participating in our professionally designed programs. We would welcome the opportunity to talk to you about your company's needs. Call today to discuss how these leadership development programs can help your company reach its goals. Below is an overview of the types of leadership training courses we offer. These program would be tailor-made to meet your specific needs. How do YOU get your teams "singing off the same page" and excited to work together? By modeling good coaching, teaching vital leadership skills, and frequent check-in. Peak Performance!� facilitators can help perfect your coaching skills. More motivated employees, focused on organizational goals, performing at a high level are the results. These incredible experiences take you deep into the world of Optimal Leadership© - a highly adaptive form of leadership that addresses the needs of the individual, the circumstance, and the setting in which you find yourself. We�ll teach you how to assess the learning styles and personality differences within your teams. Then we�ll help you establish a long-term leadership style strategy so you can get your teams optimizing the impact they have with your customers and within your organization. The Forum is an intense, two-day retreat that helps participants identify their own "personal best" leadership style, teaches proven group effectiveness techniques, and prepares them to lead team members to greater accomplishments. It begins before the program starts, with leadership and teamwork assessments and pre-program preparation. The retreat itself is fast-paced, highly interactive, and activity-filled. Participants develop personal mission, values, and leadership statements to guide them. They learn building blocks of group effectiveness, practice giving and receiving feedback for continuous improvement, create action plans to optimize their team leadership, and commit to ongoing assessment and development programs. Participants come home with a "toolbox" full of tried and true tools that they can use with their teams, and receive a complimentary subscription to Teamwork Report�. Peak Performance!��s monthly electronic resource of tools for success. leadership training and leadership development needs.